Become a Certified Paranormal Investigator or KRG Division Leader today! Kahuna Research Group is an established group of professional researchers, healers and publishers with headquarters in Hawaii, and we are looking to establish additional paranormal, educational and publishing divisions and researchers around the country. Be a KRG Member or Division Leader today and take your paranormal research - and your CAREER - to the next level! Please note that we cannot accept new members that have active cases open with KRG. General Description: The Assistant Director will assist the Director with managing Kahuna Research Group's divisons. Previous experience with directing an anomalous research group or a PhD in Parapsychology/Metaphysics is required. General Description: We always approach our research in a professional manner. We require new investigators to begin training within 15 days of joining the group. (See Step 4 below). Investigators are general members who assist and conduct onsite and offsite paranormal research and investigations. Investigators also assist with setup and takedown duties, evidence review, and other assigned duties. Additional: TV appearances, book opportunities and more come from hard work as an anomalous researcher. We're currently speaking with multiple producers and directors about future shows. General Description: The Psychic / Medium / Sensitive investigates and researches cases using subjective psychic abilities such as clairvoyance, clairsentience, clairaudience, claircognizance, psychometry, telepathy, mediumship, and/or empathic abilities, collectively known as Extrasensory Perception (ESP) or psychic abilities. General Description: The team documentarian takes candid pictures and video of the team in action, including setting up equipment and doing vigils. The position requires good knowledge of photography and a keen eye for capturing a "Kodak moment." General Description: When the need arises to call in an expert, we would look to establish as many professional relationships as possible. Simply become a KRG consultant and we will call upon you from time to time. General Description: A book publicist is typically employed by a publishing house, and it is his or her responsibility to generate media interest in a new book. he or she ultimately wants journalists to write pieces about the author and his or her book, in order to increase public interest and sales. The job is a combination of the marketing and publishing fields. Typically, there are no formal educational requirements to become a book publicist. The job involves a lot of communication and writing, so some publicists may choose to pursue degrees in English, journalism, marketing, or communications. It is necessary for a publicist to be assertive, outgoing, knowledgeable in his or her field, and of course someone who enjoys reading. ​General Description: Book editors work for publishing companies to prepare an author's work for publication. They work closely with design artists, compositors, production personnel, marketing departments, and experts in the field to design an attractive product, guide it through the various levels of production, and then promote it once it has been published. Working closely with the author, they ensure that the work being produced has high literary merit and is free from inconsistencies, including grammatical and spelling errors. Please follow these four steps to become a KRG team member. You should call or email the KRG Director and let them know of your interest in becoming a Certified Paranormal Investigator with KRG. This will give you a chance to ask questions, and will allow the Director to get to know you and what skills you will bring to the group. Only qualified professionals who are dedicated to helping the community and goals of Kahuna Research Group will be considered. The second step to becoming a KRG Investigator is to get your KRG email address. (yourname@kahunaresearchgroup.org). This will be used for all future correspondences pertaining to KRG and our research. A KRG email address is only $25/year and all new KRG emails can be forwarded to your existing email address. This step shows us you're serious about beginning the process and shows any future email recipient that we are a professional organization. ("name@kahunaresearchgroup.org" is slightly more professional than "name@gmail.com,"
The SOP will be emailed to your new KRG email address. Familiarize yourself with the KRG Field Investigator's Standard Operating Procedure (SOP) manual. To ensure that only competent investigators conduct witness interviews, on-site investigations, and collateral contacts with public agencies and others, formal Paranormal Investigator training is essential. It begins with our manual which will help you determine if taking the final step is the right course of action, or not. The KRG Field Investigator's SOP Manual is the basic reference for training and duties as an investigator. All trainees must possess an original copy of the manual and become completely familiar with its contents. NOTE: The SOP will be emailed to your new KRG email address once you complete step 2 above. Also available on the documents page for existing members. Trained KRG Investigators are ranked among the most highly trained certified paranormal investigators in the country. As always, it begins with dedication and effort. If you've never performed an investigation, then training is essential. The Paranormal Investigator course provides you with the training and forms necessary to be an effective investigator. Beginning the course is the fastest way to become an official investigator with KRG because it shows us that you are serious about paranormal research. Finishing the course and passing the final exam tells us that you are ready to be one of our premier investigators. Television opportunities are limited to those who have begun or completed this course. 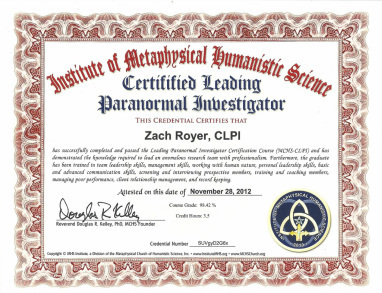 The Paranormal Investigator Certification Course (CPI) is a serious and professional academic online study course taken by hundreds of students. You will receive 2.5 CEU's (college credits) for passing this course. This course is not filled with fluff nor does it only contain information freely available online. It features fresh thinking and concepts that will not only educate, enrich, and balance you as a paranormal researcher, but will also enrich your life and relationships. Topics discussed include how to conduct investigations, equipment, and basic evidence analysis. This course is a basic certification course focusing on ghost/spirit activity and includes certification as a "Certified Paranormal Investigator" (CPI), certificate, ID card, and ID badge sent in high-quality PDF format by email. NOTE: If you have already taken the ParaNexus or IMHS CPI Course, do not take this course; they are the same. However, you may be interested in taking your paranormal education further by getting an advanced certification or PhD in Paranormal Science, Parapsychology, Ufology, or Cryptozoology. Advanced certification programs are available from ICHS. PhD degrees are available at IMHS. Course Segments: Theory & Concepts • Tools & Equipment • Investigations & Evidence • Revealing, Explaining, Resolving, & Cleansing • Appendices.